Flying as much as I do, it is really the only time I actually sit back and watch a movie. I recently watched a classic "Andy Hardy" film with Mickey Rooney on a flight to Las Vegas, and it reminded me of the time I got the privilege of spending time with the Hollywood icon. Being in awe my entire life of classic Hollywood and those legendary performers on the silver screen, it was no accident that I acquired a 1926 vaudeville theater, The Arcada in St. Charles, 10 years ago. And as the theater has enjoyed tremendous success evolving into a top live-music venue the past few years, it has also been host to some of the biggest, most recognizable names in show biz. From Debbie Reynolds to Shirley MacLaine, Don Rickles to Joan Rivers and Hugh Jackman to Kevin Costner, many A-listers have appeared on the historic stage once graced by Edgar Bergan & Charlie McCarthy, George Burns & Gracie Allen, the Little Rascals, the Three Stooges, Duke Ellington and so many more. 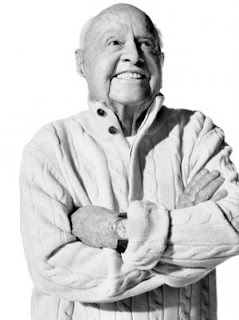 But one figure stands out, who, ironically, was larger than life despite his famously small stature: Mickey Rooney. Up until just a few years before his passing, Rooney was doing a multimedia musical career retrospective show with his eighth wife, Jan. When the opportunity to host his show was offered to me, I think it was exactly 12 seconds later when I signed on the dotted line committing to the booking. This was going to be truly something special … talk about Hollywood royalty! What put the experience over the top was when his wife Jan called me and asked if she and Mickey could come in a few days earlier to do press. This guy was a true pro! Once the word got out that not only was he coming, but he was also taking requests from the press, it became complete craziness just managing the literally 200 interview requests from all over the world. He was a bit standoffish when we first met. But I went down on one knee as if to kiss his ring, and he warmed up pretty quickly. He had this warm, grandpa-ish demeanor, with a 24-carat smile. Once in a while he would kind of venture off in another direction with either his conversation or his attention span, be he came back pretty quickly. So we visited television studios, phoned into radio stations and lunched with journalists. It was a press junket frenzy! He was tired, but was tireless when it came to giving the people what they wanted. "I never want to disappoint people. 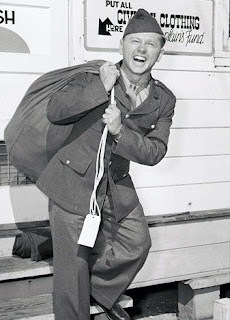 I've been in more major motion pictures than anyone else in history -- the only actor to have appeared in at least one film for eight straight decades, and that doesn't happen if you disappoint the fans," he proudly belted out. "We were making a movie a month sometimes, especially during the Andy Hardy years" he said. "We were all exhausted, but we just kept going. We (young actors) were taught to stick it out and that stayed with me my whole life. So let's get going!" After a while, I let my bold side take over and during dinner, I thought the time was right to cautiously bring up Judy Garland. "The biggest loss of my life, of all of our lives," he said. "Such a tragedy. She really was the most marvelous entertainer in the history of show business." I asked why she wasn't one of the eight women he ultimately married. "She was the sister I never had," Rooney said as he glanced up to the sky. "She had this major insecurity that frankly, endeared me to her. It was tough on all of us. I tried to be there for her as much as I could. But those early years were especially tough on her. We worked countless hours a week and slept when we could. Ya know, we barely made $5,000 each for most of our films! And we were the biggest stars of our time!" Part of my promotion of his live show that we were presenting at the Arcada Theatre was to take him to visit a few special events and active senior communities. He loved it! It was hysterical because it was all impromptu. I would walk in with Mickey and he would just start shaking hands with the residents. Those people could not believe he was there! Many of them would have tears running down their faces as smiles were exchanged. But the disbelief factor was way off the charts. One of my fondest memories was when I took him to a meeting of Italian American War Veterans. I went to pick him up at the hotel and he walked out of his room with an actual war veterans hat on. He actually traveled with it! We arrived at the meeting to a hero's welcome. There were about 200 former soldiers, some in their 80s, who stood at attention and saluted Mickey as we walked in. It was very reverent and emotional. The commander of the veterans' post welcomed Rooney and thanked him for his service in World War II. 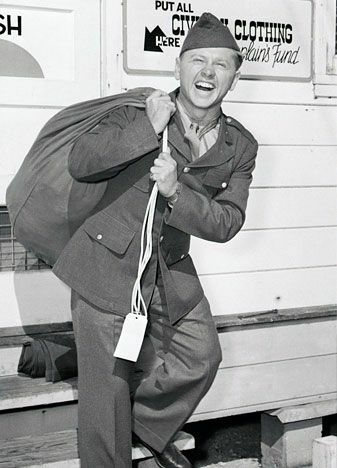 "Mickey, what you and your Hollywood friends did for the soldiers overseas, entertaining them and keeping up their morale, was nothing short of heroic," the commander said. At that statement, Mickey jumped out of his seat. "Wait a minute," he said. "I served in the Army under Patton. I wasn't telling jokes and singing songs -- I was fighting, just like all you guys." He then folded back the lapel of his jacket to display his Bronze Star for Meritorious Service, which he received in the war. A quiet but very noticeable gasp filled the room. "I lost friends and I saw a lot of death out there. That is why I am such a proud American. That is why I came here tonight. To thank all of YOU! You are the heroes, we veterans are who saved America." So after a few days of these tremendous experiences, I thought I would host a dinner in honor of his 89th birthday. I had an upscale, Las Vegas-style supper club at the time, and it was packed. I reserved my biggest table, right in the center of the room. Nobody knew he was coming, so as we walked in, you could hear countless forks being dropped onto plates. "Holy cow, is that Mickey Rooney?" folks at each table whispered to one another. As he turned and smiled, the room burst into applause. He and his wife, Jan, sat down, along with an entourage. I had steaks, lobster and my best pasta dishes locked and loaded, ready to be presented. But then his wife whispered to me that his favorite meal was Italian salami, cheeses and those little pepperoncini, so I brought out a platter fit for an Italian king. I had these two brothers from Russia playing four-handed classical piano featured that night in the restaurant. It was truly amazing how their hands crossed over each other to create a complex sound from the piano not normally heard. Then I had a fabulous Three Tenors-style act enter the room, belting out songs while literally surrounding Mickey and Jan at their table. I had remembered asking them earlier in the week what it was they liked to listen to, and they said the Three Tenors was their favorite. So I brought in this act as a gift to them. Both Mickey and Jan were in tears. After the performance, I asked Mickey if he would come to the front of the room to answer a few questions for the guests. 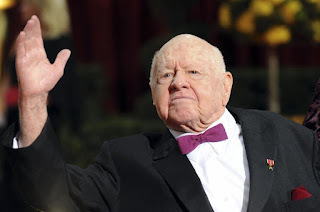 Per classic Mickey Rooney style, he not only answered questions for people but also asked if he could play the 100-year-old piano I had in the restaurant. He was masterful. We had all forgotten what a fine musician he was, often playing the drums in his earlier films. What a night! The guests, who were unaware any of this was going to happen, mind you, walked out of the restaurant just shaking their heads in disbelief after what they had just witnessed (the food was incredible, too, I might add!). He and Jan did the show. It was heartwarming and fun and tremendously cute. All week he kept thanking me for my hospitality, saying he wanted to give me something very valuable. "I can see you are a very good guy," he said. "I decided at the War Vets event that I was going to give you something special." Would it be those vintage cuff links he was wearing? Maybe his personal pen? 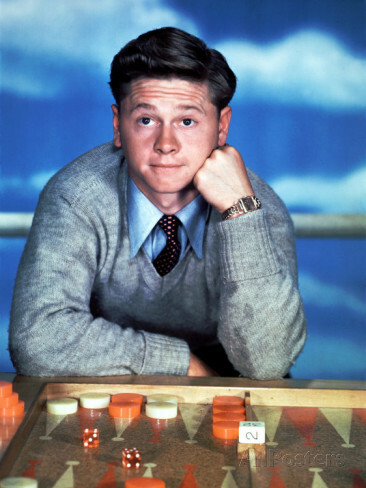 An autographed Andy Hardy tie? He leans over to me and said: "I am going to give you something extremely valuable. You know the term 'The Best?' You go and copyright that term. Then you open up 'The Best" cleaners, 'The Best' grocery stores, 'The Best" clothing stores. You get the picture! You'll make millions!" Jan looked at me, I looked at her. We both knew he wasn't kidding. There was a deafening silence. I thanked him profusely, and he sat back in his chair, with great pride. I shoved some salami from backstage in my mouth to keep me from bursting into laughter. As we said our goodbyes the next day, he did present me with a personally autographed photo from "Boys Town," which I will always cherish. I am sure he is "Striking up the band" up there right now.